I have been running this Supergirl site for over nine years now. I feel blessed to have met and interacted with so many Supergirl fans. And I am humbled by how generous so many people have been to me over the course of the years. The latest example is from blog friend Firebird. I met Firebird back in 2015 at the Boston Comic Con. He had traveled to the con and gave me the CW Supergirl swag bag from San Diego Comicon from that year. I also got the opportunity to see all of his incredible Supergirl commissions. 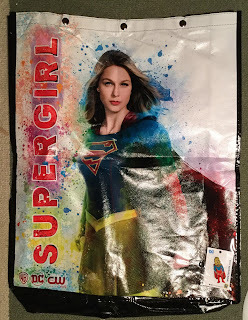 Firebird also went to this year's San Diego Comic Con and was lucky enough to snag an extra Supergirl swag bag which he sent my way. It is a gorgeous and relatively huge bag and came with a Supergirl pin. I can't thank Firebird enough for giving me this great gift. I am truly appreciative and grateful. I doubt I'll ever get to San Diego Comic Con so getting some memorabilia from there is just fantastic. On top of that, inside the bag was a bunch of programs and con TV Guides. This was definitely a great little bonus. Just to thumb through the program and guides was just brilliant, giving me the best sense of the scope of this event. That Kirby-covered guide is about as thick as a local phone book! So thanks again to Firebird for this wonderful gift. I can't thank you enough! 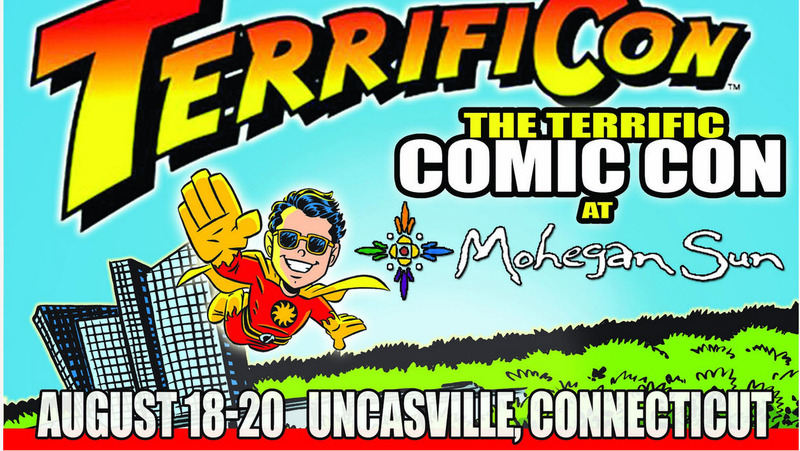 Last weekend I spent three glorious days at TerrifiCon in Uncasville Connecticut. 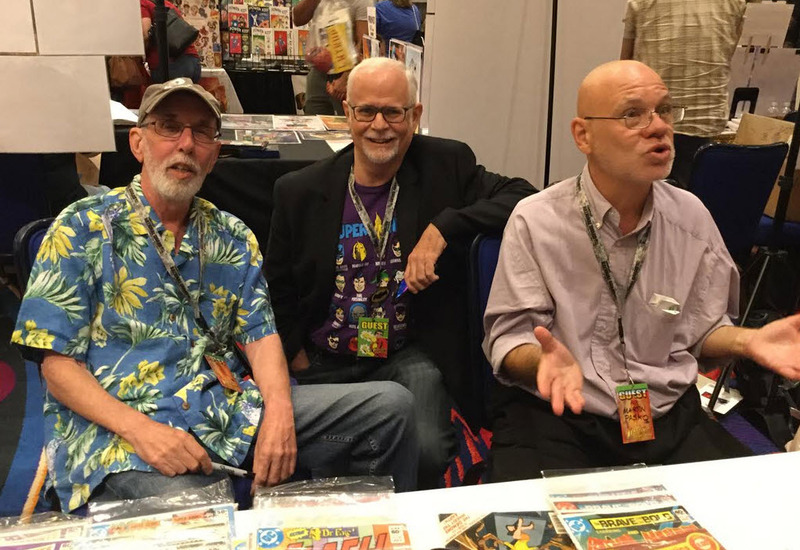 Earlier this year, my buddy and I decided that this would be our 'big con' for the season and this con was well worth the time spent. The con itself was in the convention center at the Mohegan Sun Casino. This meant a spacious main hall for the comic creators and exhibitors, a second floor for panel rooms and cosplayers, and a large entrance way area where the celebrities had tables set up to meet the fans. As a result, the place never felt cramped or claustrophobic. Also, being in the casino meant a couple of perks ... free parking and ample food choices from fancy restaurants to food courts. But let's face it, we go to these cons for the creators and to shop. And this con, unlike many, was definitely comic-centric. And that made me very happy. The guest list was a nice mix of current stars (Snyder, Capullo, Booth, Rapmund) and more legendary folks (Thomas, Wolfman, Giffen, Pasko, Englehart, Chaykin, Kupperberg, etc.). So for an old-timer like me, this was perfect. I wasn't sure who I would be getting a commission from beforehand. But once inside, I quickly made the wise decision to finally get a Barry Kitson piece. Kitson has been a favorite of mine since his work on Azrael. 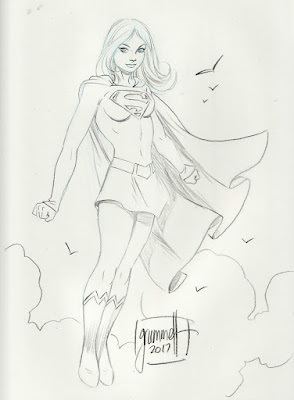 And he drew Supergirl during the Threeboot Legion run. I gave him source material for the Matrix full shirt/red skirt costume as well as the 70s hot pants version and said he could draw whichever one he was more interested in doing. Later that afternoon, I picked up this great full color 3/4 body commission. This is just a stunning piece. From the body position to the determined expression to the background, it all just crackles. I have been very lucky with my commission purchases recently. Kitson himself is just the nicest guy. Hmm ... maybe a 'Greatest Supergirl Stories' trade in the future? All the guests I chatted with were approachable and easy to talk to. As I said, it was meeting the writers of my youth that really made me this the con for me to be at. 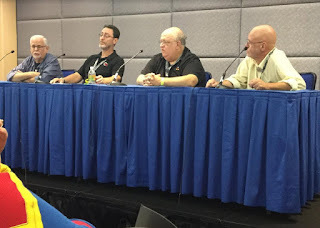 On Saturday, Robert Greenberger moderated a great Supergirl panel with Paul Kupperberg, Peter David, and Marty Pasko. They talked about the character, the 'need' for a Supergirl, her character development over the years, and touched on the show. There was also this ad hoc 'panel' at Marty Pasko's table where I heard Keith Giffen, Paul Kupperberg, and Marty Pasko discuss story-telling, current writing styles in comics, and their approach to characters. Brilliant. I got a ton of issues signed by folks, many of whom did not charge instead having a Heroes Initiative donation jar. So plenty of books signed by all, especially Giffen. 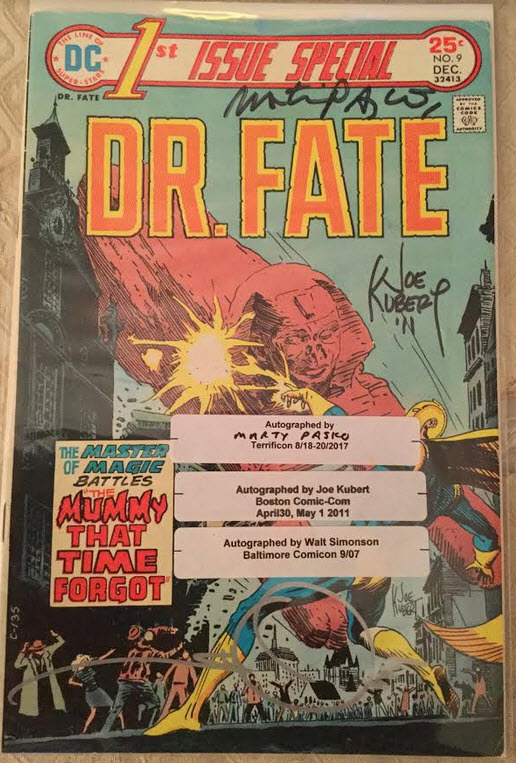 But perhaps the jewel of them all, even more than a handful pf 5YL Legion books being signed, even more than Action Comics #500 being signed, was getting Marty Pasko to sign 1st Issue Special #9. This Dr. Fate story is one of my all-time favorite comic stories. And, having run into creators a bunch at cons over the last year, I now have the trifecta of signatures of Pasko (writer), Simonson (artist), and Joe Kubert (cover artist). I also met Steve Englehart and got him to sign some of his Detective Comics issues. 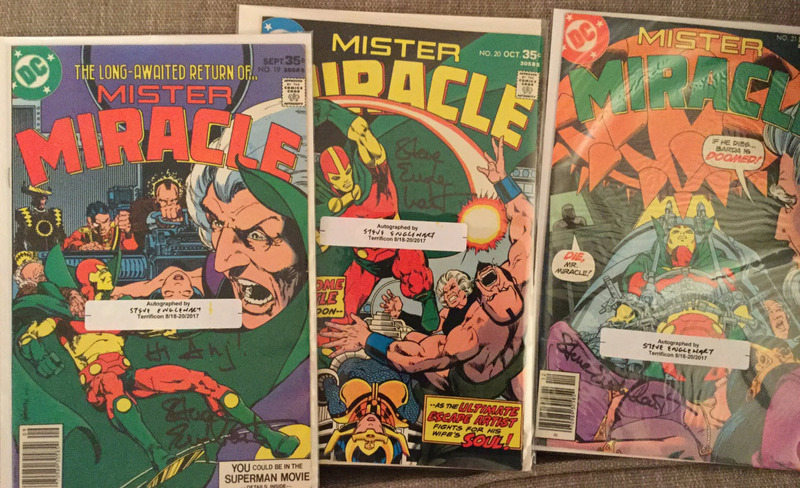 But I also got him to sign his Mister Miracle issues from the 70s, more books from my formative comic reading years. Most of my comic purchases were from the dollar box, fleshing out my Sojourn collection as well as the recent Sif run on Journey Into Mystery. I also bought a bunch of kids comics to keep in my office and hand out to kids. 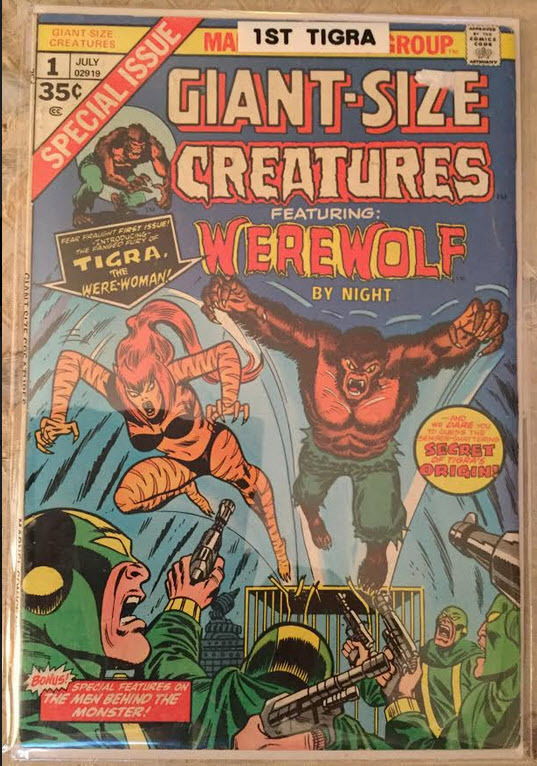 The one big purchase was Giant-Size Creatures #1, the first appearance of Tigra. 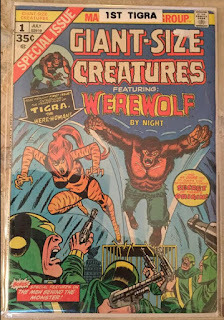 Early Tigra is a tiny niche pocket of my collection. So it was great to finally check this issue off. So nothing but praise for the convention. I figure this will be one to hit again next year. To start off, there is no mention of Supergirl in Gotham City Garage. And the cover doesn't grab me at all. So my time on that title might be brief. Second, there are a few new books, like Demon, that might be impulse buys. There is one new title I will definitely be grabbing (shown at the bottom). Lastly, there are no *FINAL ISSUE* notices for any of the super-books and that makes me happy. On to the actual super-solicits. “PLAIN SIGHT part one!” This public service announcement is brought to you by the Department of Extranormal Operations! You saw how Supergirl hid a murderer underneath National City right before our eyes. What other dangerous secrets is she hiding? She is not human, and therefore, she cannot be trusted. D.E.O. agents will be stationed at every school to ensure their safety! Your cooperation is greatly appreciated. Check out that cover! Okay, I have a lot of faith in this title and the approach that Steve Orlando has brought to Kara, giving us a bright, optimistic Supergirl who is trying to bring hope, help, and compassion for all. And I doubt Jody Houser was brought in to give us something grim. But that cover and that solicit read a little like what could be the beginning of another 'Dark Kara' arc. And, as I have said since the inception of this blog, Dark Kara never works. Maybe this is how 'overpowered' Kara looks and the villains are turning people against her? Earlier this month, Supergirl #12 came out. It was the first to sport an Stanley 'Artgerm' Lau variant cover. Artgerm certainly produces eye-grabbing, truly spectacular art. And I immediately notice a couple of aftershocks. 1) The number of Supergirl issues on the rack of my dramatically less than usual for a Wednesday afternoon and all the Artgerm covers were already sold. 2) My store thankfully pulled both covers off the shelves figuring it would sell out quickly. 4) I already wondered if these covers would somehow drive up orders/sales. Well, lo and behold, it looks like that might be true. Action Comics #986 came out this week, the second and final part of the Only Human arc by the fill-in creative team of writer Rob Williams and artist Guillem March. 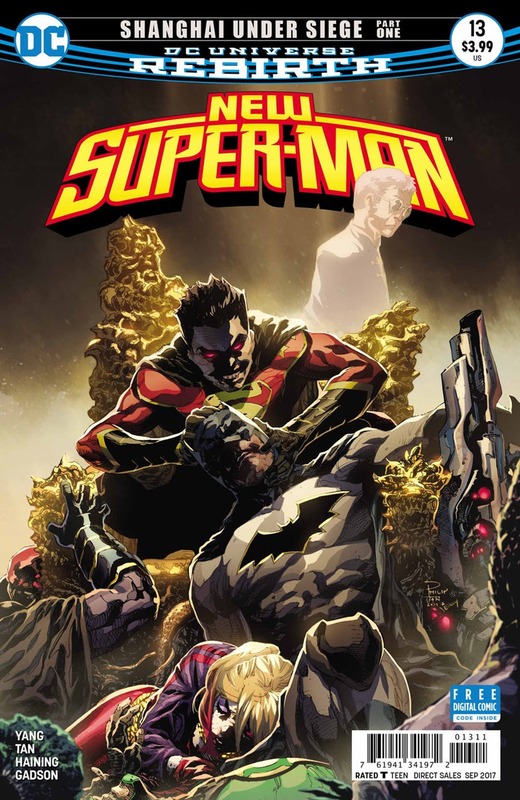 The story is a fine pause on the bigger storylines of the title, examining the new relationship between Lex and Superman and commenting on human nature. One of the things that has felt new in the Rebirth era of books is Lex actually being something of a super-hero. While more narcissistic and evil attitudes always seem to be bubbling just below the surface, Lex has pretty much been flying the straight and narrow. And Superman has had to reluctantly accept Lex as being the good guy he has been. I don't know, if I were Supes, if I could ever trust Lex. But Superman is also supposed to be optimistic, thinking humanity is inherently good. And that friction is good grist for the mill. This story kind of peels back the curtains a bit, showing who Lex truly is ... and maybe showing how Lex is struggling to be good as well. Rob Williams makes sure the right character moments are in here, using a pretty insignificant conflict with the Machinist as the scaffolding that this main character thrust of the story is built on. And Guillem March brings a scratchy sort of urgency to the proceedings. And we get a great Mr. Oz moment at the end to bring us back into the main plotline. Lastly, I am well aware of the comic history of covers being bait that rarely signifies what is on the inside. But I was waiting for a brawl with Titano that simply never happens. 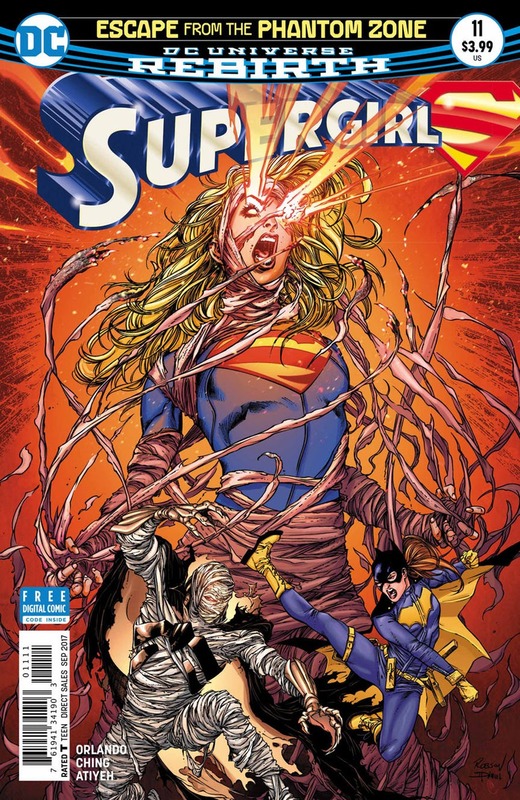 Supergirl #11 wrapped up the Phantom Zone adventure and Batgirl crossover. For all of those hoping the Batgirl appearance would prop up titles, it didn't happen. And for those (like me) thinking that Aethyr and Psi mentions should make people flock to the book, we were wrong too. I know, I am not the average DC reader. So how did it sell? 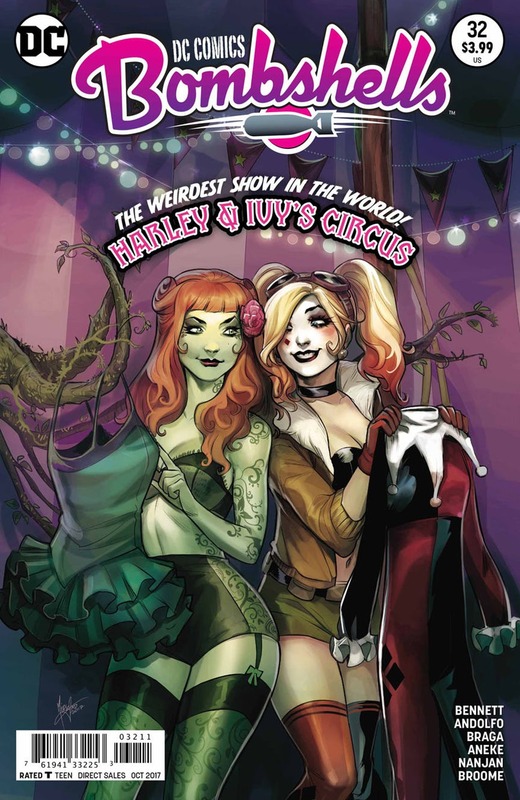 Supergirl #11 was ranked #104 is sales, surrounded by a number of female led books: Spider-Gwen, Jessica Jones, and Bettie Page! The book sold/was ordered at 21,319 units. This was down about 800 in orders from the month before. There is room for hope though. The new art team on the book is great. But more importantly, my store sold out of the ArtGerm variant and that book was already selling for $10 at the convention I went to last weekend. Perhaps ArtGerm variants will lead to increased sales?? 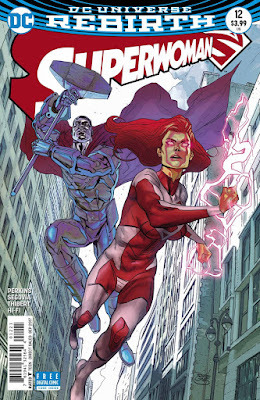 Superwoman #12 continued K. Perkins reclamation of the title. It finished up the so-so story of Steel's family members and Skyhook. To be honest, the super-action of that story really took a back seat to the growth in Lana. And that trend really skyrocketed in this month's issue. The book sold 15,209 which seems to be holding its own spot. There hasn't been a dramatic bottoming out of sales. I really hope Perkins has the time to tell her story and keep readers around. This book is on the upswing for me. New Super-Man #13 continued the excellent story forming the Justice League of China as they fought Emperor Superman. This book has been a brilliant mix of humor, action, and character growth. I have loved it since its inception. But this is the book with the weakest sales. It only sold 12,951units. I get the sense that the pace in New Super-Man has picked up. Maybe Gene Luen Yang has been told he only has so much more time and want to sprint to the finish? Anyways, we should support the books we love and talk them up when we can! <! [endif]-->I wasn’t 100% sure if I was going to head to Boston ComicCon this year. I liked the more comic-centric feel this show has had since its inception. I knew that FanExpo had bought it out and that it would probably have a more corporate, more celebrity-fueled feel to it than in the past. Incredibly, the driving force for me to go was the ardent passion of my youngest two daughters have for Steven Universe. When they heard Zach Callison (voice of Steven) was going to be there, it was a foregone conclusion. We were going. With that now a fait d’accompli I had to decide my mission for the con. There were a number of creators at the con that I definitely wanted to meet. Peter Tomasi, Tom Grummett, Matthew Clark, Jonboy Meyers, Ty Templeton, and Tom King were all new faces for me. And there were other creators who I had met before that I wanted to run into again, most notably Tana Ford and Joelle Jones. And I grabbed any commission sketches while there that would be gravy. I decided to go Friday by myself to get my stuff out of the way. This way Saturday was a family day. First things first. The venue, the Boston Convention and Exhibition Center was massive. It was big enough that people could line up inside and wait in the air conditioning as opposed to outside in the baking sun (like at the old venue). There was a lot of space so the con didn't feel claustrophobic (although the comic area did feel somewhat cramped). And there was a food court inside the building which made lunch easy. The pass I got allowed me to enter the con space at 2pm as opposed to official opening of 4p. Amazingly many of the comic creators also filed in early. As a result I got much of the 'heavy lifting' out of the way. I was also able to get a sketch book into the hands Tom Grummett. He signed issues for free. And a full body commission was very affordable. Despite being that early I was already something like 6 on his list so he told me to check in on Saturday afternoon. Sure enough, the following day, he presented me this fabulous commission. I am thrilled. There is a nice little feeling of mischief behind that innocent look. And she looks young, like the current Supergirl should. I'll post the other commissions I got on later days. But I thought I would share some of the Supergirl specific issues I got signed. Supersons #7 came out last week and finished up the quick 2 part Titans crossover while reintroducing the Forgotten Villains to the Rebirth universe. As has been the norm for this title, this book was a heck of a lot of fun, showcasing the difference between the two title characters and maybe giving Jon a little more confidence in his dealings with Damien. As I said above, this is a quick two part story and that rapid pace is perfect for this book. There is this free-wheeling, over the top action that is just perfect. Even with the brawls and confrontations, writer Peter Tomasi continues to add wonderful little character moments that bulks up the friendship/rivalry of Superboy and Robin. Add to that crisp, brilliant art of Jorge Jimenez! Jimenez knows when to stretch the anatomy of his character to complement the story. At times there is a sort of cartoony action and even Looney interaction a la Bugs/Daffy between Jon and Damien. And so that sort of stylized art just work here, bringing some oomph to the story. Plus, as a long time reader, seeing the Forgotten Villains again was an added treat! On to the book. 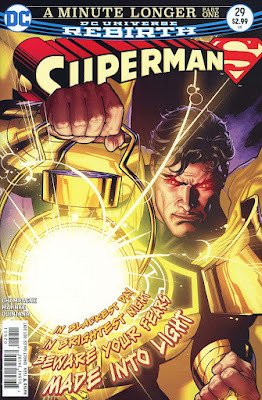 Superman #29 came out last week and was a nice little read, merging the Green Lantern mythos and Superman. The usual plotting team of Peter Tomasi and Patrick Gleason are not here. Keith Champagne, who I know mostly as an inker is writer here. Doug Mahnke is on art. Champagne does a good job of bringing us the inspirational hero that Superman should be. Between tirelessly looking for missing children to spouting some words of wisdom to public to sacrificing himself for others, Superman is very much the classic hero. I even like how Champagne describes Superman's vision powers. 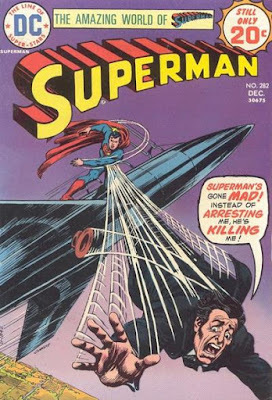 As for the story itself, Superman as a symbol against fear makes perfect sense. And Doug Mahnke brings his usual powerful style to the proceedings. In particular, the end scenes with the villain are incredible. Even the title page is fabulous, an almost poster worthy pose. But this grand, superhero fights supervillain story was a bit welcome after the last history lesson issues. Trust me, I loved those issues. But getting back to the super-stuff was nice. 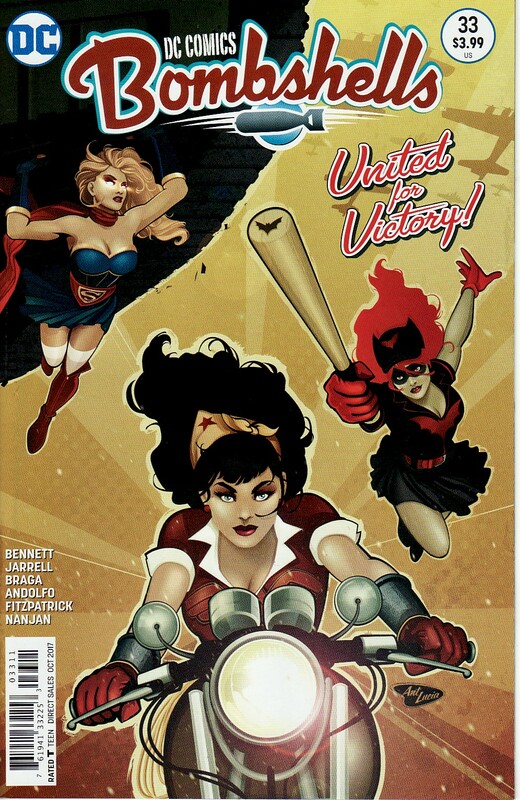 DC Comics Bombshells #33 came out this week, the last issue of this volume of the characters and my last issue reading this. When this series started out, I was very impressed at writer Marguerite Bennett's ability to weave a very solid story about World War II and the arrival of super-women fighting the Nazis. The first year was fabulous. But since then, since the battle of London around issue 12, it has felt like the book has lost its way. There are a lot of ideas in this book but the stories haven't read well. It's like those ideas haven't gelled into a narrative. As a result, the book has been something of a mess. On top of that, there has been a bit too much cutesy dialogue recently ... something that I might have tolerated more of the story around it was stronger. And so this last issue wraps up the story. Bennett has brought a bunch of subplots together into a large battle in Russia. So Supergirl's grief and Raven's familial issues and Lois's optimism are all here. But it seems so scattershot. So much happens with little explanation. The moments in the story where I have said to myself 'I guess I have to roll with that' were numerous. Now I will admit that I haven't been paying significant attention here. Perhaps my laziness as a reader because I haven't been engaged has been part of the problem. One of the things that hasn't been a problem on the book has been the art. In particular, I discovered Mirka Andolfo, Laura Braga, and Sandy Jarrell in this book. All three are here and shine. In particular, Mirka Andolfo has become a favorite in my mind. I haven't even done my overall take on this year's Boston Comic Con and I am already heading off to my next convention. 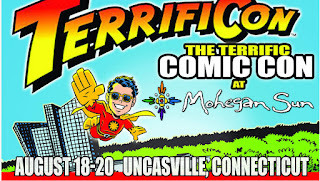 Terrificon is a convention a little south of me in Uncasville Connecticut and I am considering this my big con for the season. For me, this just seems to be a convention more built for me. There are a ton of comic creators that are going to be there who had huge impact on me in my salad days of comic reading. Yes, there will be current mega-stars there. You don't get much bigger these days than Scott Snyder and Greg Capullo. And I will be hoping to get on commission lists for Brett Booth and Barry Kitson. But it is the veterans that are going to be there, creators who I haven't met yet at other cons, that is the big draw. And so I'll be there with bells on! 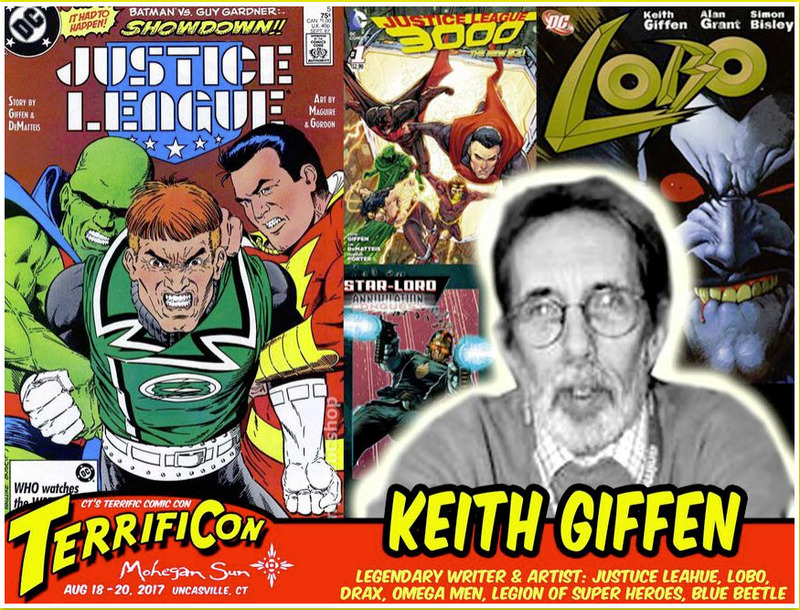 Let's start out with Keith Giffen! Keith Giffen!!! He plotted/drew Legion of Super-Heroes in the Great Darkness Sage era. He wrote/drew/created my beloved 5YL Legion. He wrote the bwa-ha-ha Justice League. He wrote the Doom Patrol. He wrote Justice League 3000/3001. I seriously could probably fill a whole long box to bring to have him sign. So distilling this down to my usual 8-10 books is proving to be difficult. I may need to head to his table once each day. 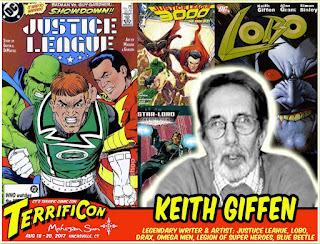 Seriously, I am geeking out that I will be meeting Giffen. 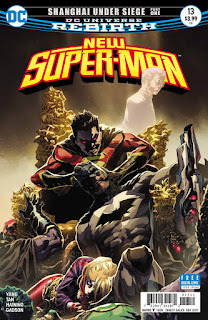 New Super-Man #14 came out last week and continued to story of the Justice League of China fighting the fascist rule of the evil Emperor Superman. Once again, writer Gene Luen Yang provides a very entertaining issue, moving the plot ahead, stuffing in an incredible amount of character development, throwing in a great throwdown, and ending on a cliffhanger. What more could you ask for? And yes, this ultimate throwdown of three super-teams from China is a great action piece. But for me, no big surprise, it was the personal moments - specifically between Bat-man and Wonder Woman that made me the happiest. This is a book basically about kids becoming heroes. And there should be growth. Given the tenuous shelf life that most comics have these days, Yang isn't taking the long road on some of the subplots here. And kudos to him for that. For the readers enjoying this book, we deserve to see these moments. The art is again done by Billy Tan and I just loved the polished look of the book. It somehow fits the tone here. Tan is able to bring the right feeling to both the action sequences and the quieter scenes. Yang and Tan together really click. I wonder how much more I'll have this book to enjoy. Everyone should be reading this book. It is a ton of fun. 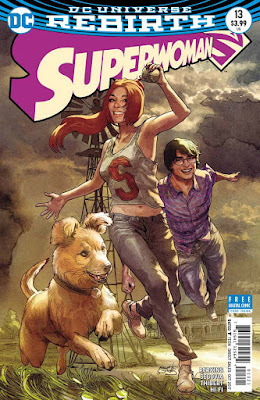 Superwoman #13 came out this week, and like Supergirl, I think it might be the best issue of the title so far. Writer K. Perkins weaves story for us. 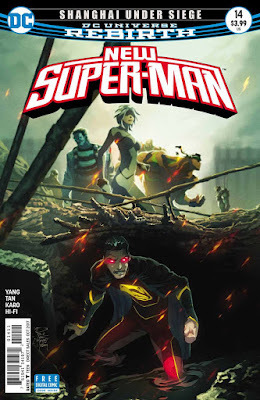 We have a framing story set in the present day where a mind controlled Lana is fighting Lex Luthor. 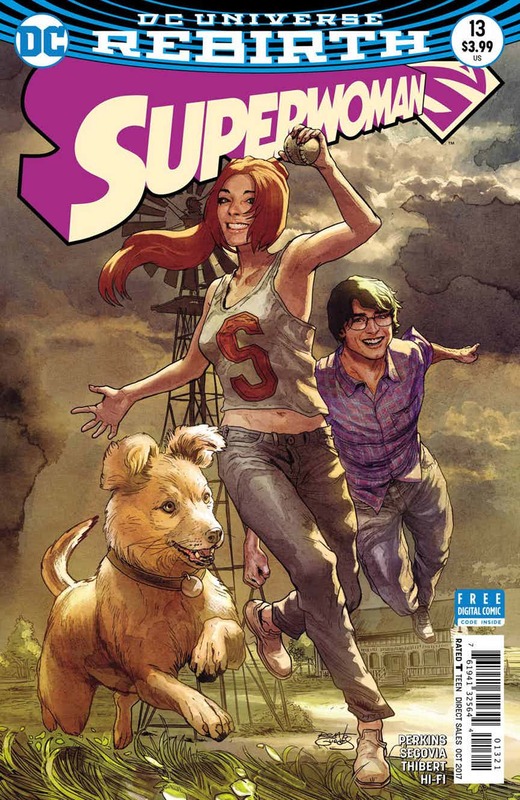 But we also get a flashback tale of Clark and Lana's adolescence back in Smallville. It all ties into Lana's origin and how she has maintained her Superwoman powers. (Of course I would pick the sepia-soaked nostalgia of the Renato Guedes variant). Now there is no doubt that I am an absolute sucker for Smallville Lana stories and most of this issue is a flashback to those early years. That always works for me. But Perkins updates some of this story slightly. 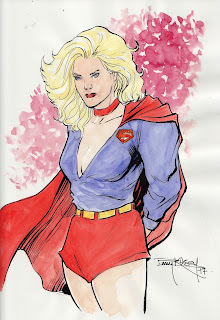 Gone is the vapid cheerleader Lana conniving to reveal Clark as Superboy (who I know doesn't exist in the current DCU). Instead we get a smart, independent, young woman who is bored with the idyllic small town life. This Lana better jibes with the Lana that we have now. And it isn't such a dramatic change to make me think 'this isn't Lana'. And the art by Steven Segovia and Art Thibert is powerful. There were times that I was reading this issue that I paused on a page to just take in the art and make my eyes smile. I hope these two stay on the book. Put it all together and you have a Superwoman book that seems to have put the first vexing arc behind us and sifted through the stabilization issues. Now we have stories moving forward instead of fixing the problems present when looking back. Seriously, kudos to Perkins for wringing a story out here, complemented perfectly by the art (and colors by Hi-FI!). I hope DC and readers notice what is unfolding here! 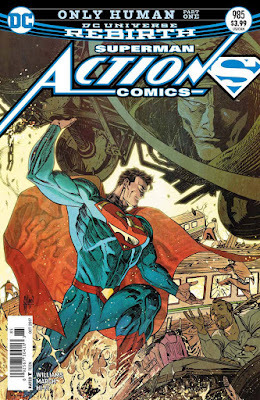 Action Comics #985 came out last week, a new arc with a guest creative team of writer Rob Williams and artist Guillem March. I suppose after the superb Superman Revenge Squad story as well as the upcoming Mr. Oz reveal, regular writer Dan Jurgens deserved a little bit of a breather. 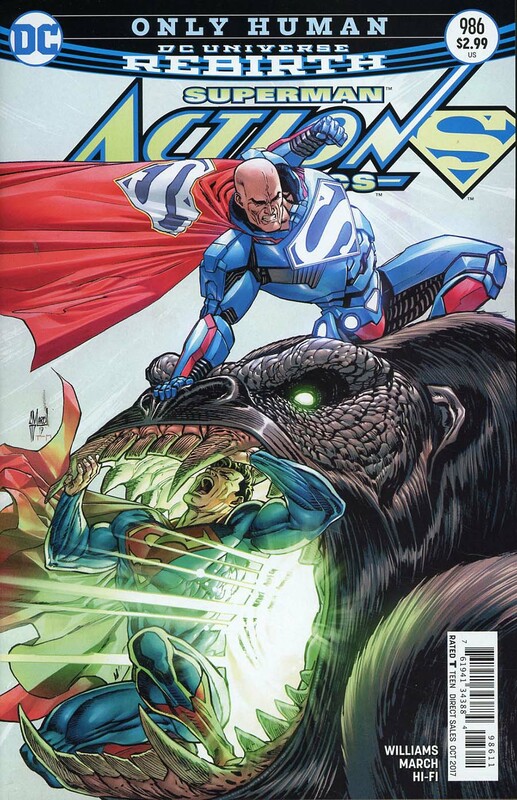 This issue explores the new dynamic between Lex Luthor and Superman. With Lex being a 'hero' now and part of the Superman Family, but still having some nefarious history with the Man of Steel, this relationship is suddenly fresh soil to till. From the God-Killer arc to Revenge to this Only Human, it has been interesting to see a Superman struggle with a Lex who seems to be on the right side of humanity. As a reader it has also been hard to take Lex at his word. Every so often he says a line which makes me think he is the same old Lex, just wearing a sheep's clothing. Writer Rob Williams (who I know best from the quirky DCYou Martian Manhunter book) tells a solid tale of trust and mistrust even if he brings back The Machinist as a villain. I have to say very little of the Geoff Johns/JRJR run on Superman has stayed in my head. Was the Machinist part of Hordr? Did he die? Do I need to go back and look? And I know Guillem March best from good girl art and covers. His art here isn't that style at all, bringing a rougher edge than what I am used to. 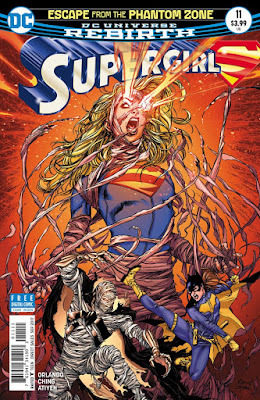 Supergirl #12 came out this last week and is probably my favorite issue of this run to date. This is a fast moving issue with intrigue, action, and some teenage angst. There is punchy dialogue. There is a some mystery. There is just incredible art by Robson Rocha and Daniel Henriques. And there is a Stanley 'Artgerm' Lau variant cover. If this title started out like this, we might still be selling 40K a month. It's not that I disliked the first year of stories. But the Cyborg Superman arc was something of a bummer to start out on. And Brian Ching's somewhat loose pencils were definitely a style I needed to become accustomed to. Now with the opening arc behind us, we are moving out of 'origin' and into adventures. Steve Orlando is crackling here. This is the Cat Grant I want to read. These are the villains I want to see fighting Kara. And this is the caring Supergirl still reaching out to those who have hurt her as she moves forward. Plus, there is a lot of Legion working its way into this arc. Maybe Supergirl will join that team when we eventually meet them in the Rebirth DCU. And I just have to say one more time in this introduction how much the art just sings on the page. This is detailed, energetic work which just sings. You see every clothes wrinkle, every hair strand, every crackle of energy. I hope everyone out there in comic land notices this book and trumpets it. We finally are entering my convention season! Boston Comic Con is this weekend (!!) and I will be going at least 2 of the three days. I have been going to the con since its inception when it was a tiny show in the basement of an insurance building. It has grown immensely over that time. While that growth has meant that I have met a ton of creators, it also has meant a sort of creep in scope to now include non-comic, pop culture celebrities. And then, last year, the local coordinators who ran the show sold it to Fan Expo. I honestly worry that the feel for the show will change. All that said, the guest list this year of comic providers is just as fantastic as in the past. I have a list of creators that I am hoping to run into and chat. Unfortunately, unlike prior years, I haven't been able to set up any commissions beforehand. And I have also noticed that over the last couple of years the price of commissions has skyrocketed meaning I probably won't be able to get as many as I used to. So here is a list of the folks I am eyeing for a commission as well as some folks I am pumped to meet. I'll have a small stack of books for all the creators listed below to sign (hopefully). 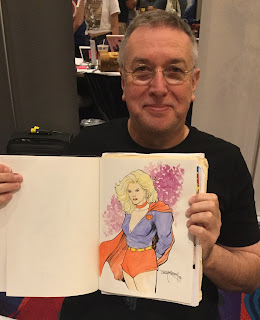 Earlier this week I appeared on the DigestCast show of the Fire and Water Podcast Network to discuss The Best of DC Blue Ribbon Digest: The Many Lives of Supergirl. One of the stories in that digest was from Superman Family #165, a tale where Linda Danvers becomes a guidance counselor at the New Athens Experimental School and wonders if she should continue a career as Supergirl. That time period, of Kara questioning being a super-hero, isn't one of my favorites. I like the Supergirl who is fierce in her defense of the helpless and a warrior for justice. Rereading that story reminded me of the back-up feature in Superman #282. In that story, Superman tries to impart some wisdom to Supergirl, telling her a tale from Krypton that in some ways reverberates with her current dilemma. Now Supergirl is really a small part of this story, only part of the framing sequence. But it is worth reviewing. This story is also the first appearance of Nam-Ek, one of my favorite Kryptonian villains. Lastly, this issue is also worth obtaining for the main story, 'Lex Luthor ... Super-Scalphunter.' That story, written by Elliot S! Maggin with art by Curt Swan, is a bit bonkers. Luthor vows to scalp Superman and wear the Man of Steel's locks as a toupee. He also dons his famous purple and green battle suit for the first time. DC Comics Bombshells #32 came out this week, the penultimate issue of this run. The storylines of all the Bombshells have all come together in Russia. Faora has been revealed as the villain pulling the strings from behind the scenes all along. 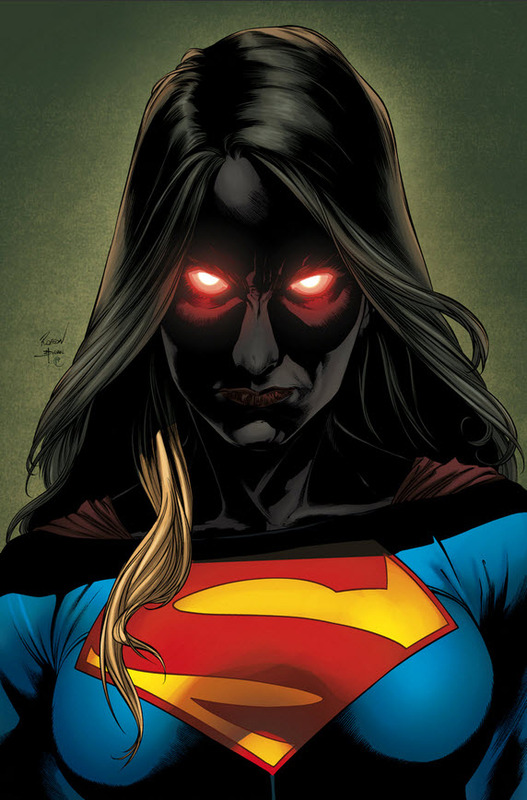 The Kryptonian general is hoping to create an army of super-powered army through cloning so she can overrun the world. Supergirl has overcome her grief. She has put the death of her sister behind her. It still motivates Supergirl but she isn't weighed down by it. The rest of the Bombshells are ready to fight Hugo Strange's army of creatures. And a bulk of the issue is devoted to Raven's origins. But I am running on fumes with this title. You all have read my thoughts about Supergirl over the years here. Have you ever wanted to HEAR my thoughts on Supergirl? Over on the Fire and Water Network of podcasts, I was invited onto the DigestCast to discuss The Best of DC Blue Ribbon Digests #17 - The Many Lives Of Supergirl. Here is the link for DigestCast so go and listen! 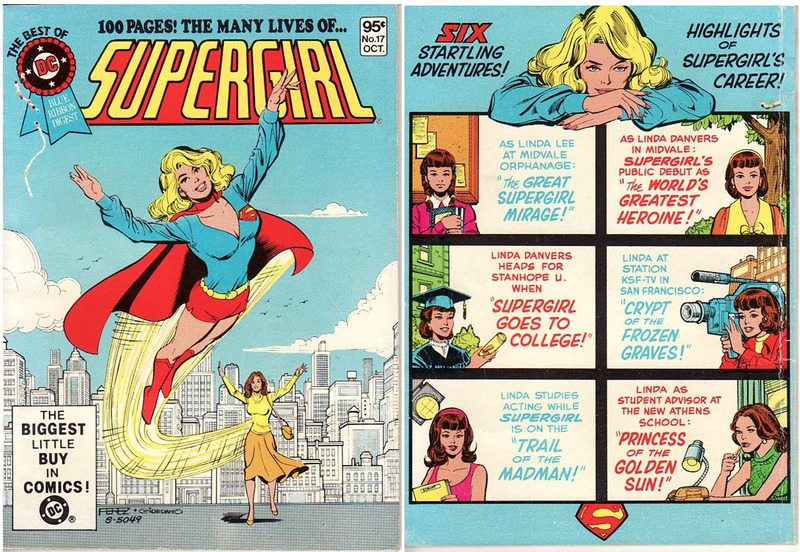 We review this great digest from 1981 showing the different periods of Supergirl's life. There is orphan and secret weapon Supergirl in The Great Supergirl Mirage from Action Comics #256 (by Otto Binder and Jim Mooney). There is revealed super-hero in The World's Greatest Heroine from Action Comics #285 (by Jerry Siegel and Jim Mooney). 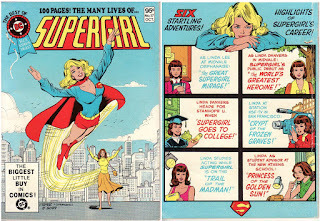 There is college student Linda in Supergirl Goes to College from Action Comics #318 (by Leo Dorfman and Jim Mooney). There is reporter Linda in Crypt of Frozen Graves from Adventure Comics #424 (by Steve Skeates, Tony DeZuniga, and Bob Oknser). There is drama student Linda in Trail of the Madman from Supergirl #1 volume 1 (by Cary Bates and Art Saaf). And finally there is Guidance Counselor Linda in Princess of the Golden Sun from Superman Family #165 (by Elliot S Maggin and Art Saaf). Whew ... a lot of great stories, many covered on this blog. Not only do I help with the reviews, I talk about Supergirl's history and my love of the character. 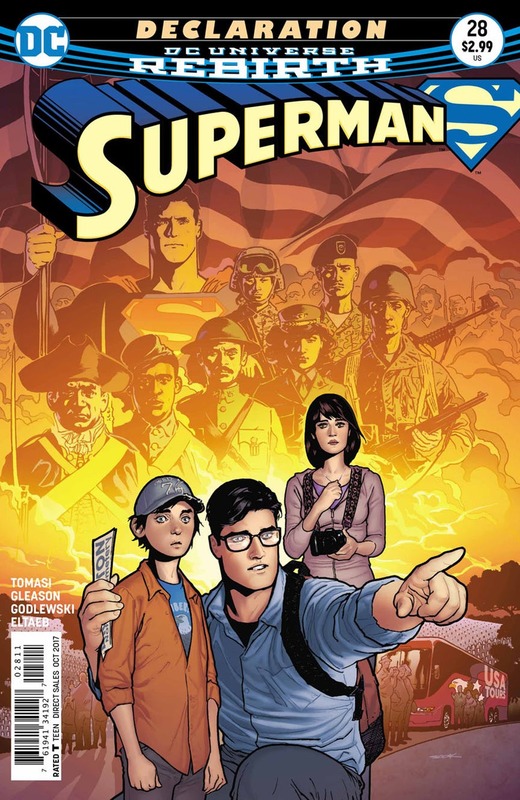 Superman #28 was the second chapter in Clark and Lois's walk through American history, teaching Jon about the sacrifice of the military in defending this country's freedoms. It also slips in some simple lessons about living in a society and how to impart change. 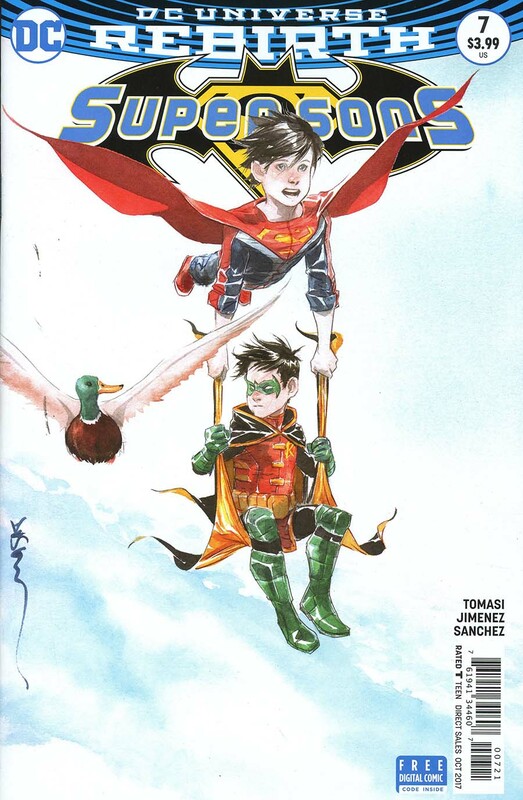 Writers Peter Tomasi and Patrick Gleason pick up where they left off last issue although maybe a little more heavy handed than they were last issue. There is a lot of history exposition here to bring the point home for Jon. While some exposition is needed, there are whole pages of near text book style discussions of events. I think dialing things back a bit would have made the issue roll a bit more smoothly. There also is a rather gruesome ending, a moment that was meant to be heartwarming but seems like it is more of a horror movie shock. That ending sort of soured some of the pride that was building in this story. The art is again by Scott Godlewski who brings a nice feel to the story. The scenes at real national monuments feel real and sharp. This report comes out in a time period where someone from DC while at San Diego Comic Con (originally linked to Jim Lee who later denied it) stated frankly that the comic market is dying and companies need to figure out how to keep it viable. Now I have heard for about a decade that the comic market is dying and it is still kicking. But when I look at the sales numbers, I do wonder if we are approaching the end of days. On to some specific sales. I was lucky enough to grab the TV Guide Comic-Con 2017 Special at the local Barnes and Noble. 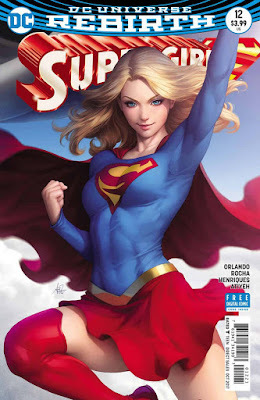 And even better, I was able to find the Supergirl cover. I love this cover. 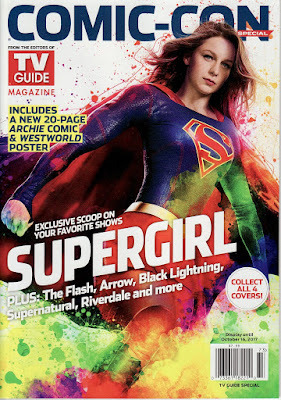 The splattering of all colors and Melissa Benoist's determined and action-ready pose is just spectacular. The Flash, Arrow, and Black Lightning all share one cover. 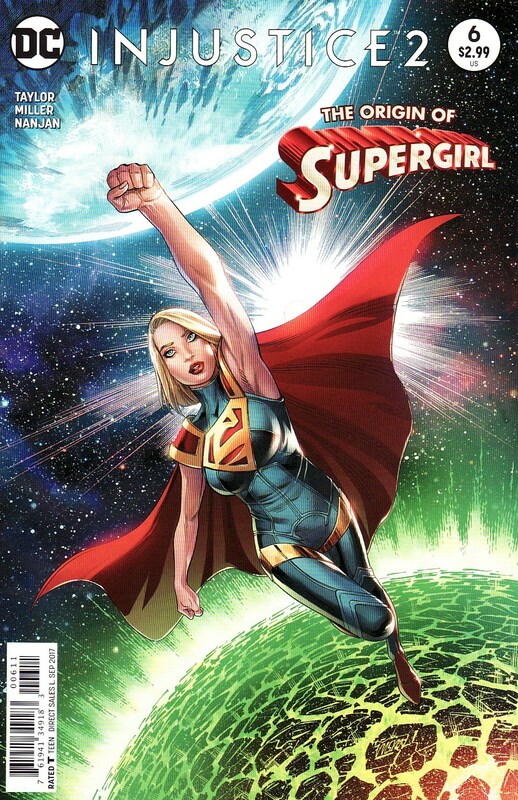 Supergirl is the only hero to fly solo on the cover! That's great. It also is the third year that Supergirl has graced the cover. 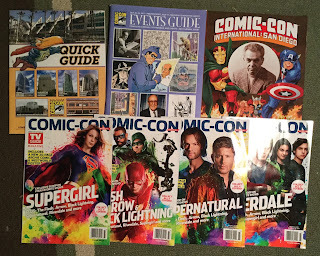 Here is the 2015 SDCC TV Guide coverage. 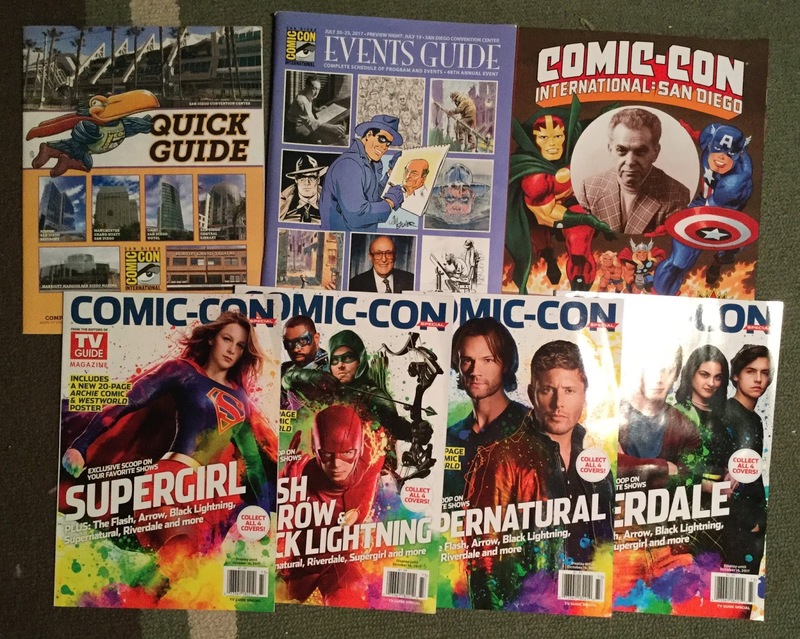 And here is the 2016 SDCC TV Guide coverage from last year. This magazine covers all shows that could be covered at the Con so Supergirl only has a handful of pages for coverage. Still, I try to support the show whenever I can. Injustice 2 #6 came out last week and sported some cover treatment announcing this to be the origin of Supergirl. Now I am not a big video game player (don't have the time to dedicate to long play) and I'm not a big fan of the premise of Injustice (Superman killing the Joker and going mad and taking over as a despot). So I have shied away from this book. All that said, I have seen Supergirl's story videos on YouTube and a number of players have told me that Kara is really treated well in the game, acting the hero. So when I saw this glorious cover by Mike Miller with the Injustice Supergirl flying in such an iconic pose, I figured I'd bite. I have absolutely loved what writer Tom Taylor has done on the All-New Wolverine book so I shouldn't be surprised that Supergirl is treated well. And Miller's art is clean and slick. And this origin story is a good one, showcasing Kara's strength, courage, and even a little nod to Silver Age Supergirl.